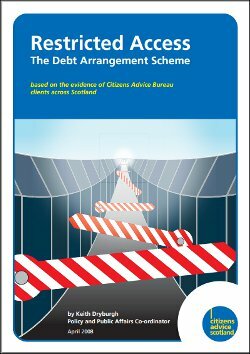 Research report which details the effect of changes to the Debt Arrangement Scheme (DAS) on bureau clients. The Debt Arrangement Scheme is a positive debt option for debtors who are willing and are able to repay their debts given the chance to do so. The scheme offers a way to avoid the stigma and problems of bankruptcy for the debtor. However, the low take-up of the scheme suggests that it has not been a success, and that other debt options are continuing to be more likely choices for those in debt. Debtors who are willing to repay their loans are still often without access to the scheme, while those with access are choosing other debt options.